You might get inspiration thinking about who this is for...and hand quilting a personalized motif in the white sashing. 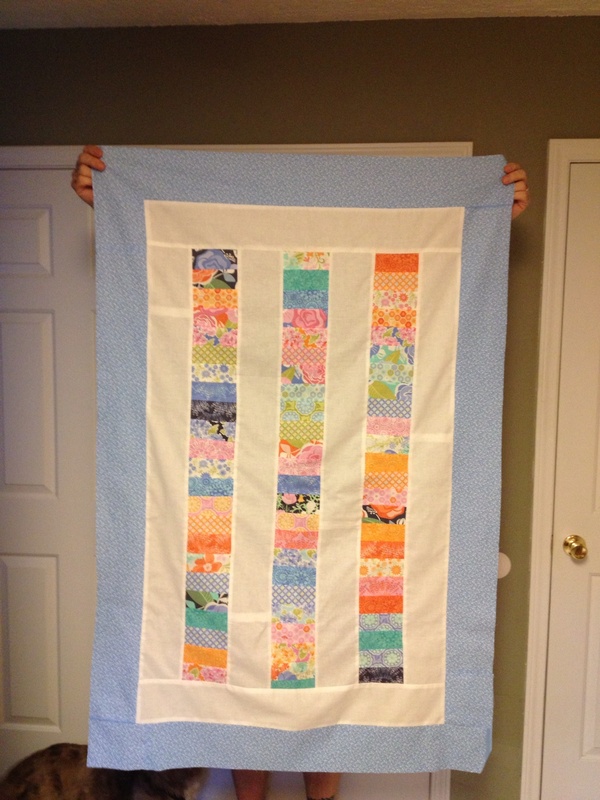 Then use your normal techniques on the blue border and the pieced strips. Sorry no help with the hand quilting, very nice quilt!! if you want it to be more modern, you could do large circles and or straight lines. Or perhaps flowers and vines. depends on the look you want... Traditional fancy feathers in the white, or try the new fad of curved crosshatching? Modern? straight lines all the way across, then maybe some simple applique sprinkled on the top? Just my thoughts of what I might do. It's very pretty! How about some curly vines and leaves? Yes, the white sashing and the borders are excellent places to show off your talents. I love cables; feathers; vines. I think something very 'flowing' in those areas would 'soften' the straight lines of the quilt - if that's the look you'd like to go with. I'd quilt vines/leaves in the white. Zig-zag in the floral print. And go with outlining the border. Whatever you decide, it's sure pretty! I enjoy hand quilting an all over Baptist fan. I don't know, but it's a cute quilt! Egg and dart would be pretty in the white border, and I would quilt around designs in the fabric for that different look you want. I see a chain design in the colored areas and cross hatch in the white.